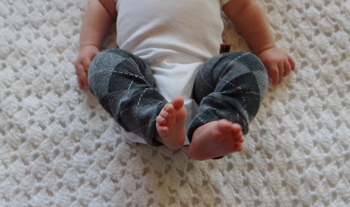 Today I am highlighting a practical a fun gift to give at a baby shower...baby leg warmers! Great for the little ones! It protects the legs and keeps them warm as they roll/scoot/crawl around on the floor. It also makes diaper changes easy peasy by eliminating the tights or pants that can be cumbersome when changing the baby. Win win! I created this fun tutorial as part of our homemade baby gifts series. All you need is a pair of adult knee high socks (for ages 6 months and up) or crew socks (for up to 3 months). Buy a pair of cute knee high socks. I got these at Target. Aren't they cute? They would be really cute for a boy with a guitar onesie. ;) Anyways, lay your pair of knee high socks in front of you. Make 3 cuts...one before the heel, one after the heel and the last in front of the toe. 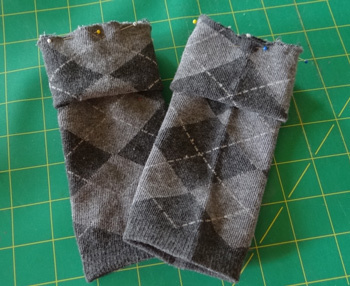 Once you have cut both socks, measure and cut them to equal lengths to each other so they will match up after they are sewn. For the knee high socks I made the long part about 11.5 inches and the shorter sections 4 inches. 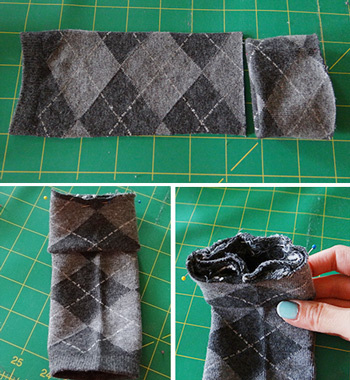 Fold the shorter sock sections so that the inside pattern is touching each other and the outside pattern is facing out. Line up the cut edges. 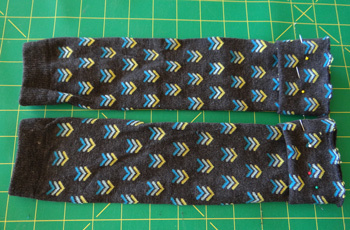 If the sock has a pattern then line up the pattern as best as you can. Slide the folded section over the larger cut sock so that the folded section is facing in and the cut edges are facing out. Line up the cut edges of the folded sock with the cut edges of the larger sock. Pin in place. 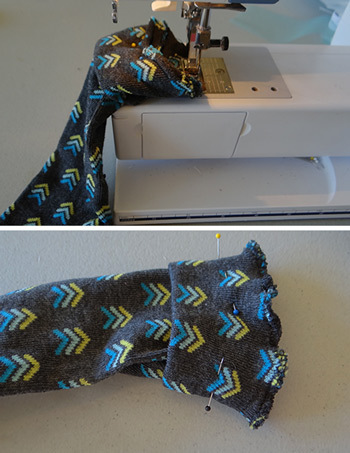 Place the sock on your sewing machine and stitch the edges together. 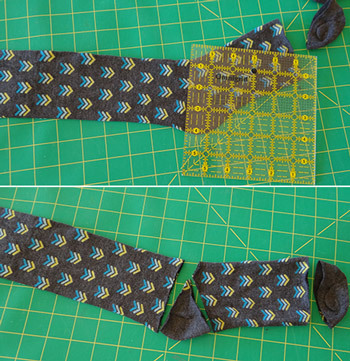 Since socks are stretchy, you will want a stitch that can stretch with it. 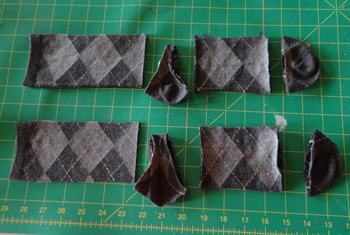 If you have a serger, you can use it to serge the edges. I do not, so I did a double overlock stitch on my sewing machine. You can also do a zig zag stitch and go off the edge to get a similar result. As you sew, pay special attention that you are getting all the ends layers in the stitching. It is really easy to miss a layer and have small ends sticking out here and there. I used a cute 3 month old baby as my model. She sure was cute wearing the socks. See how they look great at first? The process for making the infant sized baby leg warmers is the same as the 6 month size. You will just be using smaller socks. 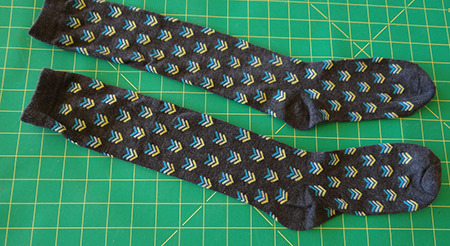 Get a pair of cute crew sized adult socks. Cut them the same as above. 3 cuts. One in front of the heel, one after the heel and one before the toe. Measure the lengths and cut them to match each other. I did 6 to 6.5 inches on the longer cut and 4 inches on the smaller cuts. 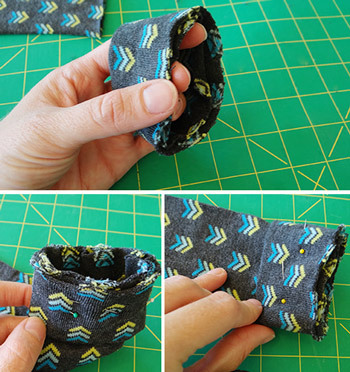 Fold the smaller section in half so that the inside of the sock touches each other and the outside pattern is facing outward. 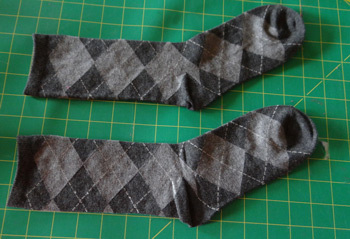 Slide the folded sock over the longer sock so that the cut edges match up and pin. Sew the same as above, either with a serger or your sewing machine with a double overlock or a zig zag stitch that goes off the edge of the material. See! So cute...and the infant size fits my 3 month old baby model much better! Hope you enjoyed our baby leg warmers tutorial. They are really fun and easy to make! I hope you get to try it out soon for an upcoming baby shower! Feel free to send in photos of your finished craft. We would love to see them!